Most animals, including humans, hang or climb down trees feet first. Not so the squirrelly-squirrel. While squirrels can climb down trees right-side up, you often may see them hanging and climbing upside down. That's because of their unique physiological attributes: razor-sharp claws paired with swiveling ankle joints. Unless you live in Australia or Antarctica, you're no doubt familiar with squirrels, those active and bushy-tailed brown, gray or black rodents whose habitat you probably share in common. The name "squirrel" is derived from the Greek and means "shade-tailed." While almost 250 species of squirrels exist in the world, they are divided into two distinct groups: those who live on the ground, and those who live in trees. There are three varieties of tree squirrels: large tree squirrels (including fox, eastern gray, western gray and tassel-eared), pine squirrels, and flying squirrels. Fox and gray squirrels inhabit areas with hardwood and coniferous trees, while gray squirrels are found wherever a high percentage of land is forested. Tassel-eared squirrels seem to prefer Ponderosa pine, and pine squirrels prefer coniferous forests. Flying squirrels often are found in dense conifer, or mixed conifer and deciduous forests. All tree squirrels have ultra sharp claws in common. 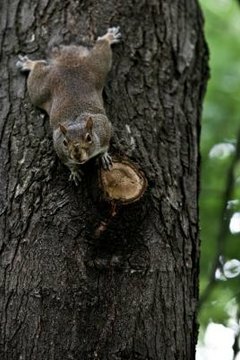 When a squirrel digs his needle-like nails into a tree limb, he can get a strong grip, allowing him to climb upwards and downwards, or even cling to a tree limb or tree trunk using only his hind legs. His claws also allow him to grip as he jumps from tree to tree, using his tail as a rudder, allowing him to swerve or stay the course. The secret weapon allowing tree squirrels to hang upside down on trees is their ankles. Unlike most rodents, whose ankles lock in place and point in one direction, squirrels have swiveling ankle joints, allowing them to climb and hang in various positions. These rotary-like ankles allow squirrels to rotate their feet 180 degrees. That way, they can hang on a tree limb, with their feet pointing one way, while their bodies point the other! About Squirrels: How Do Squirrels Climb Down Trees Head-First?